How often do you get to traverse an easy trail in the Himalayas that has a lot to offer? 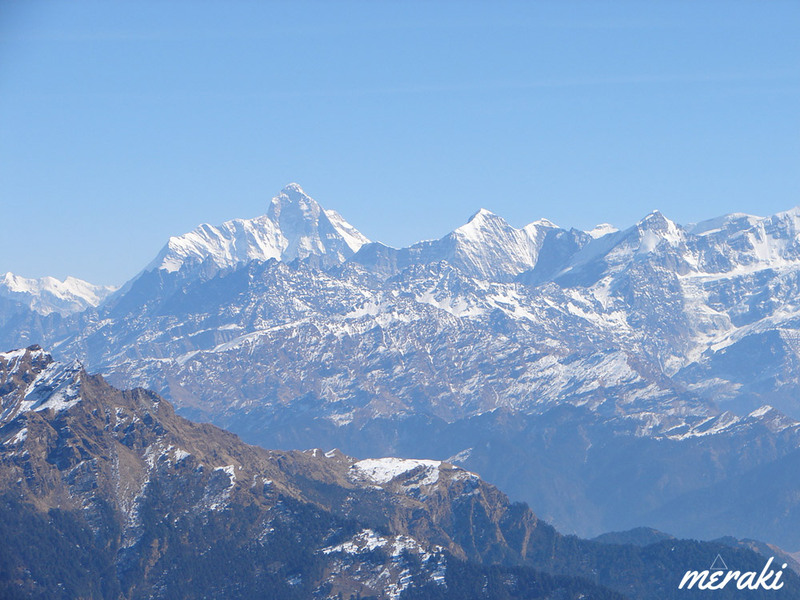 Chandrashila Summit Trek is the answer to that. 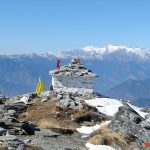 A wide variety of landscapes, dense rhododendron forest, highest temple of Lord Shiva,Tungnath Temple and panoramic views of the Himalayan range from Chandrashila Summit are key highlights of this trek. 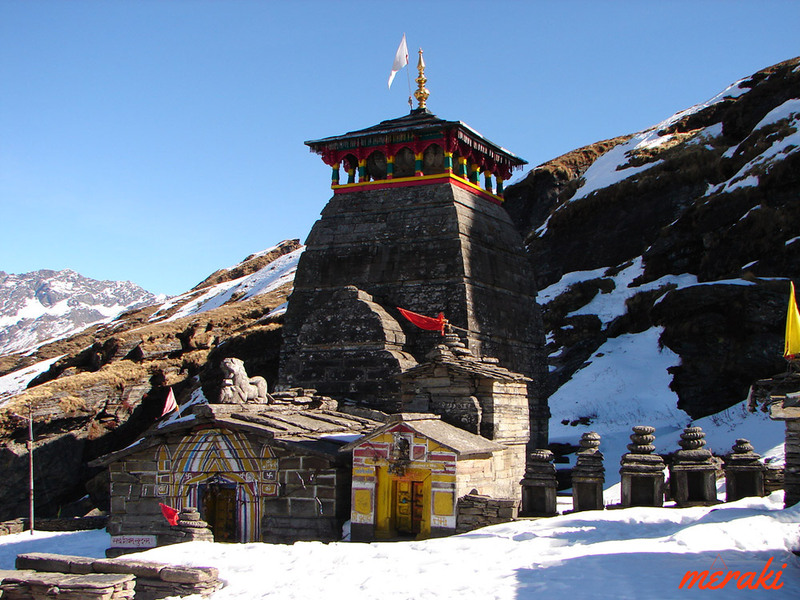 Tungnath Temple is one of the sacred PanchKedar temples. 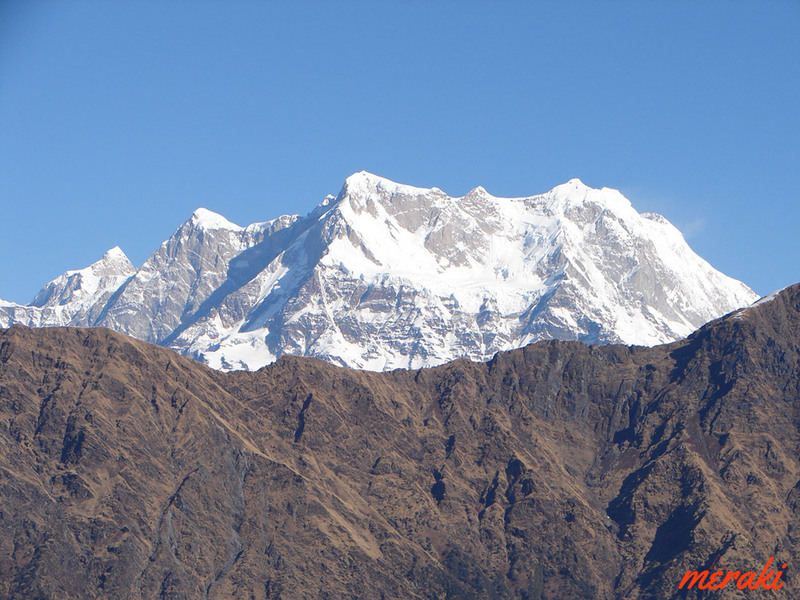 Situated at an altitude of 3,680mts above sea level it is the highest temple of Lord Shiva. 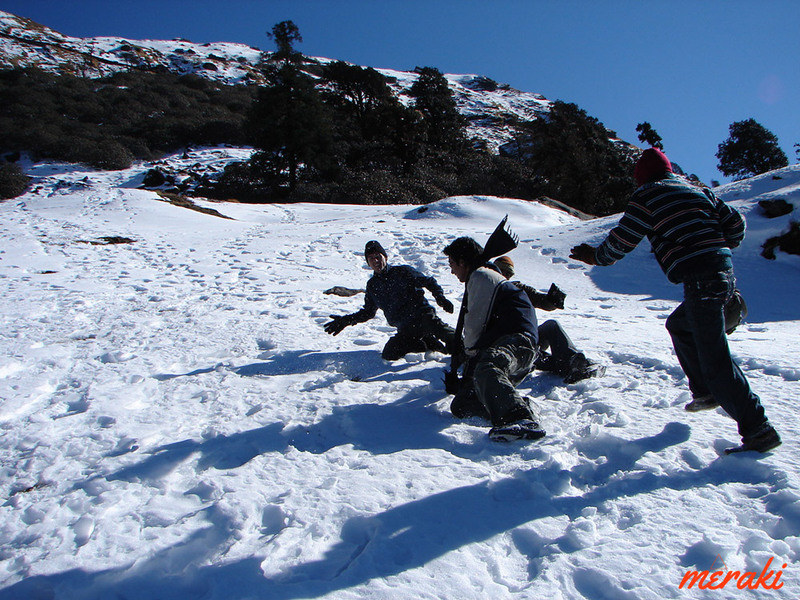 If you haven’t been introduced to the world of trekking then this will definitely be a perfect start for you. 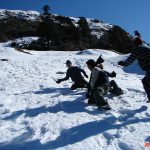 And if you are a trekker then you got to experience how much this short and easy trek has to offer. Just club couple of days off with the weekend and you will witness nature at its best. 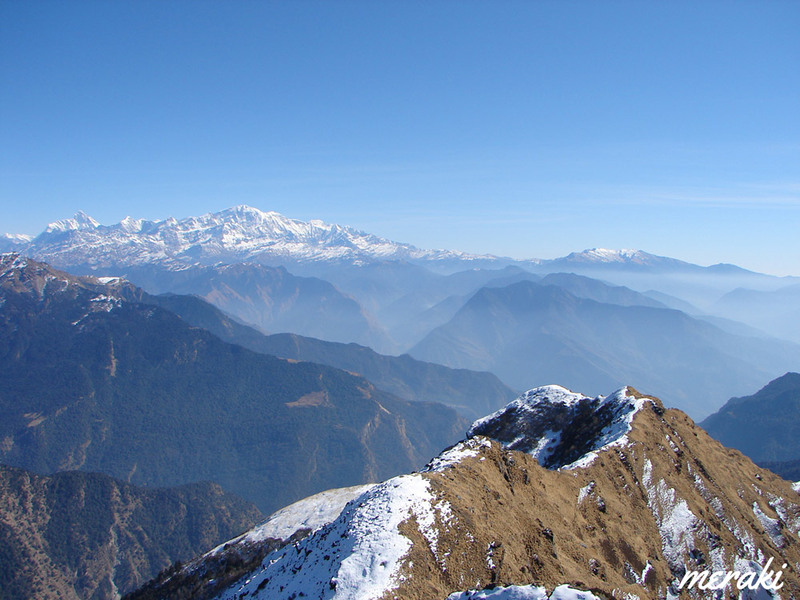 Panoramic views of Himalayan range from Chandrashila Summit. 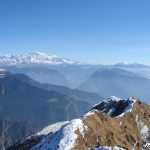 Dugalbitta is a bird watchers haven and located just 7kms before Chopta. 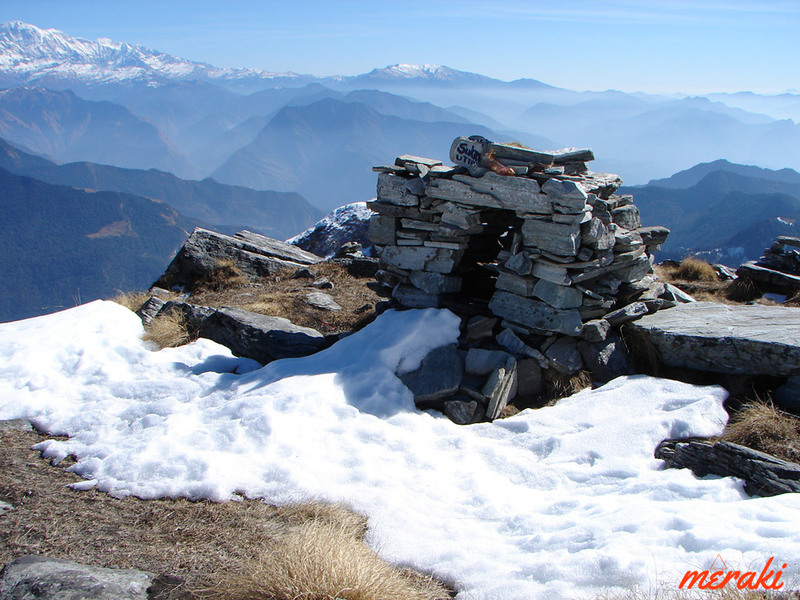 There is an old hiking trail from Dugalbitta to Chopta which is fairly untouched as most people drive to Chopta. 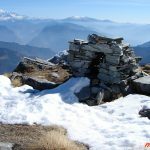 If you are running short on time or if you want to hike for less number of kilometers then you can drive to Chopta and start trekking from there, or else you can follow this less frequented trail from Dugalbitta to Tungnath Temple and thereon to Chandrashila. 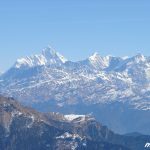 While on the hiking trail you’ll see clear views of Kedar Dome,Chaukhamba, Thalaysagar and several other peaks of Garhwal Himalayas. Chandrashila Peak also becomes visible after trekking for a few kilometers. 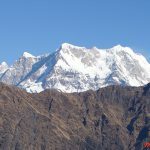 This entire region comes under Kedarnath Musk Deer Sanctuary so there are chances that you might spot wildlife in the morning including Wild Goat and Himalayan Monal. The trail from Bhrujgali to Tungnath temple is broad and well maintained. 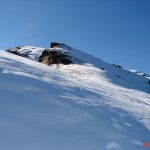 During today’s trek you will be gaining altitude in very short distance and thus the climb is steep. 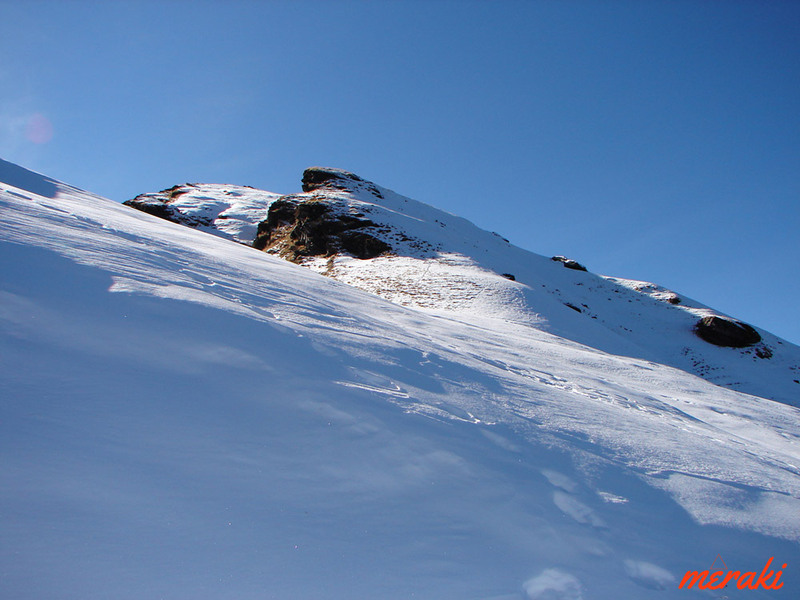 During the final stretch to reach Tungnath you will reach a rocky cliff on the right which is known as RaavanShila. Continue walking towards Tungnath Temple. Magnificent in its style and architecture Tungnath is considered to be more than a 1000 years old. 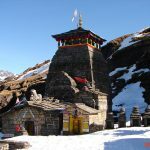 The main temple is dedicated to Lord Shiva and other small rock temples in the vicinity are dedicated to Goddess Parvati. The temple remains closed during winters. 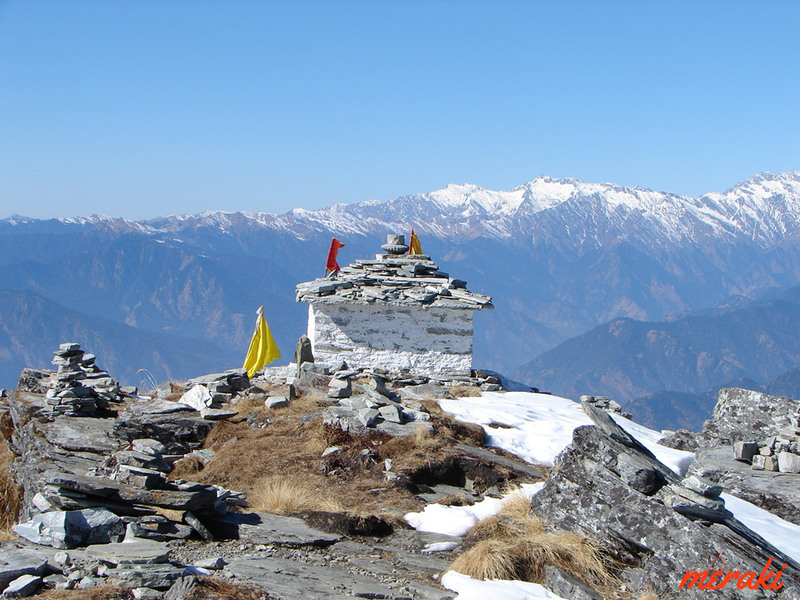 Another 1km steep hike from Tungnath temple will lead you to Chandrashila Summit. The trail becomes narrow as we climb up the meadows of Chandrashila Peak. 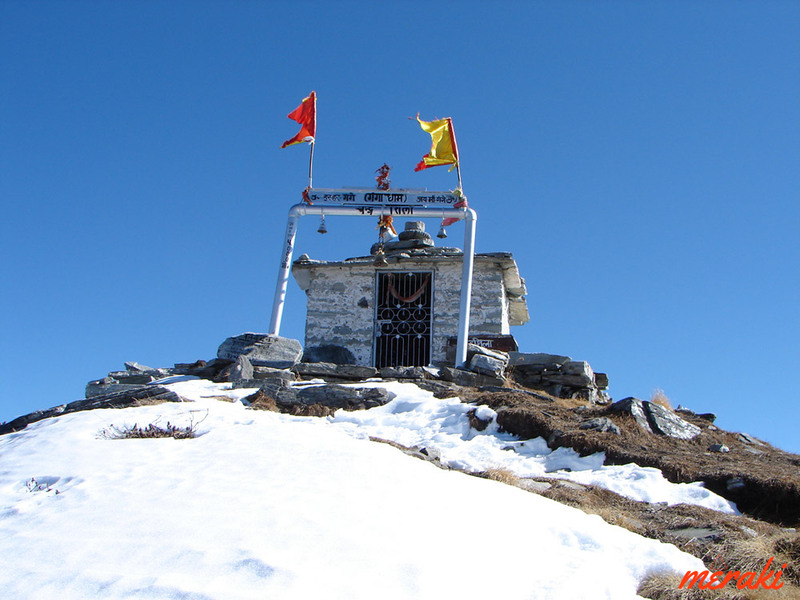 Chandrashila is the summit of the mountain on which Tungnath temple is situated. 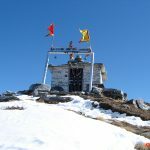 A beautiful small temple is situated on the summit along with several unique cairn structures. 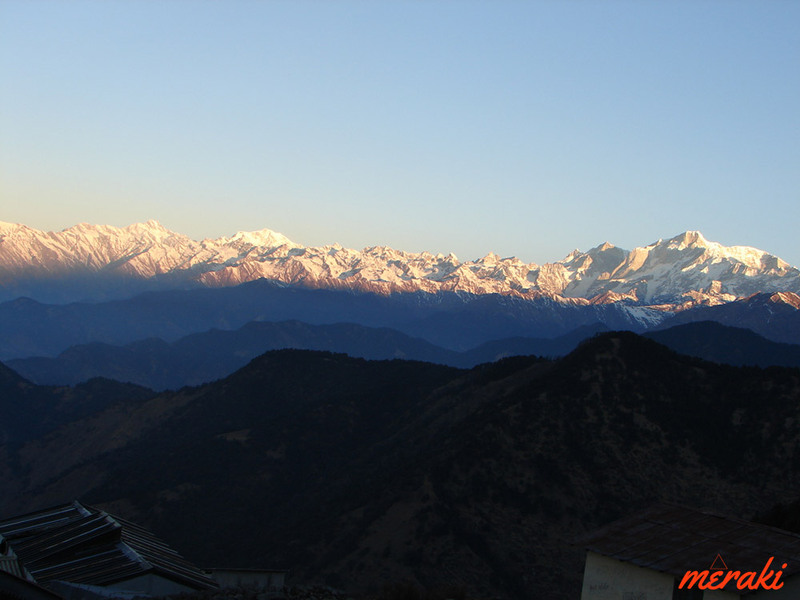 Chandrashila is perched at an elevation of 4,000mts above sea level offering splendid views of the majestic Himalayan peaks including Kedar Dome, Chaukhamba, Nanda Devi, Trishul, Nanda Ghunti, Kamet, Gangotri Ranges & more. 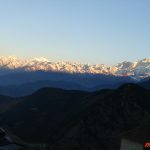 Spend some time at Chandrashila Summit witnessing the heavenly horizon and then start descending towards Chopta and thereon to Dugalbitta to end the day. If you have an Extra Day in hand the drive to 18kms to Sari Village and start 2.3kms trek to Deoria Tal. Camp Overnight and head back to Rishikesh on Day 04. Drive to Sari Village, the starting point of the 3km trek to Deoria Tal. Gradually ascending trail through the forests of rhododendron, alpine and oak trees will end up at Deoria Tal. The path is well made and broad too. It just takes one and a half hour to reach Deoria Tal from Sari Village. Deoria Tal is a gorgeous lake nestled amidst elevated meadows with few huts nearby that provides accommodation. Deoria Tal is situated at an elevation of 2,400mts above sea level with picture perfect location and backdrop of the mighty Chaukhamba peaks. The reflection of Himalayan range on the pristine waters of this lake is a view that will be etched in your minds forever.